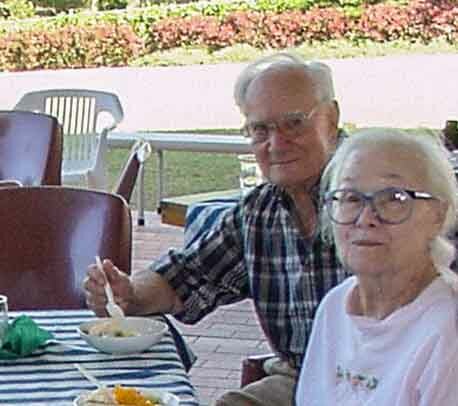 Edgar Adams relaxing in 2001 with his wife Mare, nee Vigor, the eldest daughter of Thomas Vigor and Mary Anne Vigor nee McLeod. Edgar George Adams was born in Hastings, England, on 21 Mar 1921. Edgar’s family had a strong naval tradition. His father was a merchant seaman and his brother captained a warship for England during the Second World War. His father was in the home guard as he was growing up. Before he was in his teens, his father had taught them to use a machine gun. Edgar migrated alone to Australia around the age of 16. He had sought to join the navy during the second world war but, living alone in Australia, he did not have parental permission. He was nevertheless accepted in the army in Victoria after he asserted he was 21 when enlisting in Caulfield. While the recruiting officer was suspicious, he nevertheless permitted him to join. He was trained to be a bombardier in the 33 Australian Heavy Anti-aircraft Battery. However, in being shipped to PNG, the group lost its weapons after the ship carrying the equipment was sunk. He was then attached to another Ack Ack group. He was in the battle at Milne Bay where the Japanese were defeated. This was the first land defeat they suffered in the Pacifici and over 700 of their troops were killed. He was positioned as a machine gunner. The Japanese chose to attack where the Americans were stationed – the cleared area adjoining the strip was narrower at that point. He indicated that the Americans had brought in a half track on which were mounted Browning machine guns that caused serious damage amongst the Japanese. The Americans later bulldozed the Japanese into a mass grave. The Milne Bay battle was mainly fought with Australian troops with 160 Australian and 14 American soldiers killed. The Army had told the troops that the Japanese were small people and could not see very well. Edgar said that was not true as they were very fellows and could see very well. He was subsequently attached to a naval supply group . He was sent back to Australia for a time to undertake an engineering course. In the end, this was influential as he decided not to pursue architecture but made a career of structural engineering . He indicated that what he had learnt before the war helped widen his engineering expertise. He was disembarked in Melbourne at the end of the war.He studied to be an engineer and started practicing as one around the age of 30. Edgar was responsible for designing and building many oil and petrol delivery projects for BP. Petrol pumps, petrol delivery vehicles, home heating oil delivery trucks and an oil refinery at Spotswood in Victoria. Later in the 1970’s he worked on joint BP/ Hornibrook projects involving oil bunkering barges on the Brisbane River and off shore. Lindsay Fox and John Holland were two businessmen who were given their starting contracts by Edgar and his partner.